Can I complete my confined water’s and theory at home, and do my open water with you in the warmer waters? Yes, just bring your referral documents signed by the instructor running your course at home. 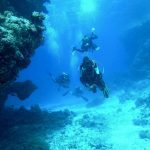 ‹ Can I go diving if I’m disabled?